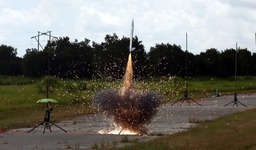 I had an enjoyful first time visiting Spaceport Rocketry Association's launch site! Unfortunately, we got rained out early in the day, so not too many flights. A thunderstorm was coming in and I almost decided to stand down. I'm glad I didn't as the onboard video from the coming storm is fantastic! The risk: The storm was very close. When the rocket landed it immediately started lightning and raining! It took 20 minutes of my rocket being out in the elements with a phone and electronics before I could begin the recovery effort. I was worried water would enter the electronics bay. I was able to recover my rocket with little problem other than wading through the bush. The GPS sent me right to it. The rain filled up about 3 inches of the fin can. I poured the water out and the cardstock seems to be drying fine. I'm glad I used epoxy. I used the Nexus 5 this time. Video quality is somewhat better than the 4. It doesn't run near as hot and the Nexus 5 will last all day out at the field without need of recharge. The Gs Max out on the Nexus 5 smaller - only 2 Gs per axis. I look forward to getting the Nexus 5x as it maxes I believe at 8Gs per axis. The 5x also has 4K video record - which will be nice. So cool Jason. That is just awesome... you can see the weather patern and the area pretty good. .. Just way cool !! Please do post screenshots !! Just awesome video ! The images for recovery are by luck! I forgot to bring my camera on the recovery mission. Due to the Insane Rockets app still being on, shock (G forces) from me untangling it from the bushes caused video record to turn on, as if it was a launch event. The videos were labeled "bogus" because the software realized they weren't a launch. I then reviewed those videos in hopes to find decent recovery images. In summary recovery images are from the rocket electronics bay Insane Rockets video recording during de-tangling, not the clearest shots, but better than nothing. They look great, I thought it was your camera..